CCA 2017 Session "Killing with Your Real Life"
This is Marty's Session from the 2017 CCA Conference about how to better tell stories from your real life using analytical formatting and techniques that are repeatable by every style comic. The most important thing to remember about the "tube," is it requires hard work and determination to get there. Many hours of open mics and other stage time, running, and re-running your stories (after you have learned the formatting) is the key! What does a story that kills look like on paper? In order to know what we are trying to create, we need to start with the end in mind. 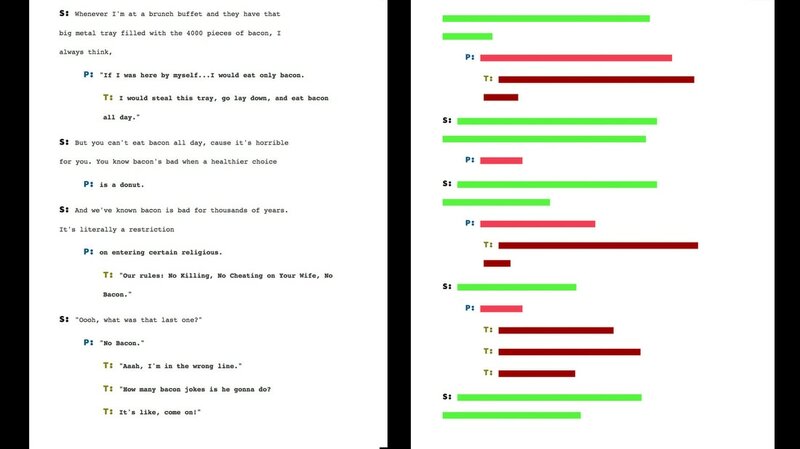 We need to identify a story that is not a setup-punch type style of comedy, watch it, recognize it, and then transcribe it on paper, and then break it down so we can know what we are trying to accomplish with our written words. Using Marty's Format (Which we will breakdown later) What does this Cosby Bit look like? Jim Gaffigan is a rapid fire, setup-punch, setup-punch delivery comic. He gets tons of laughs per minute and crushes through out his entire set with no lulls and rarely drops into story-telling mode. 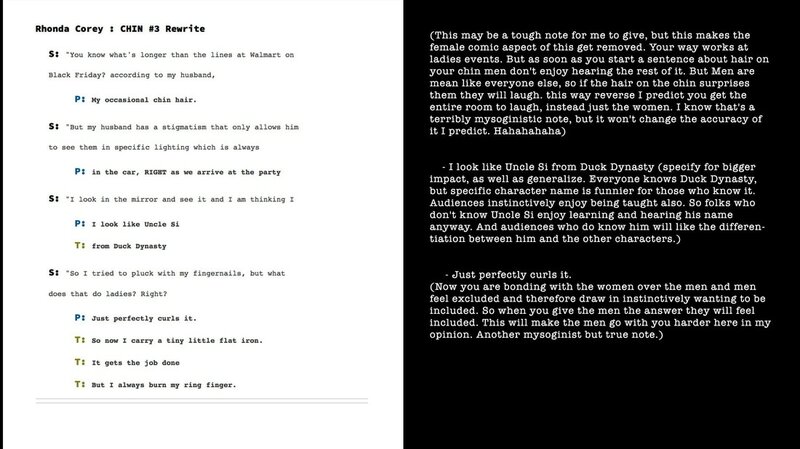 Watch this clip about bacon, then look the break down of his words in my format. The left are the words formatted. 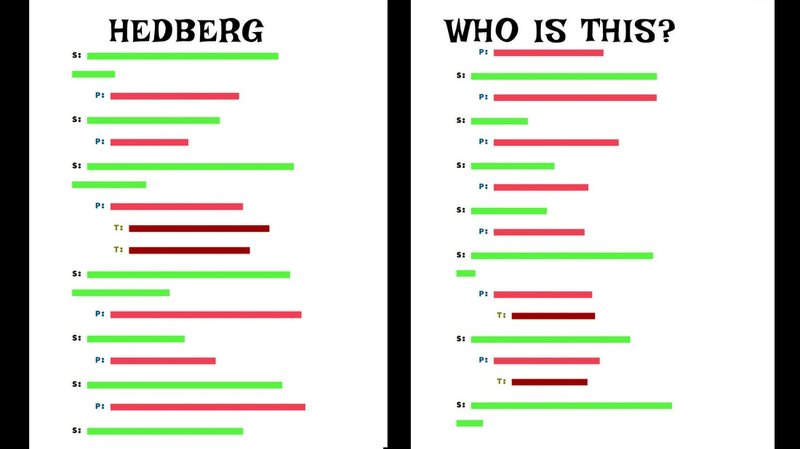 The right is the same exact set of words, but with the words covered with bars to illustrate visually what it looks like without a bias towards how funny you think the words are. 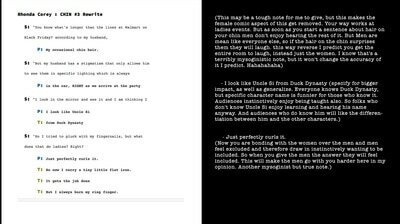 Below you will see Hedberg's setups and punchs covered up to represent just the words. 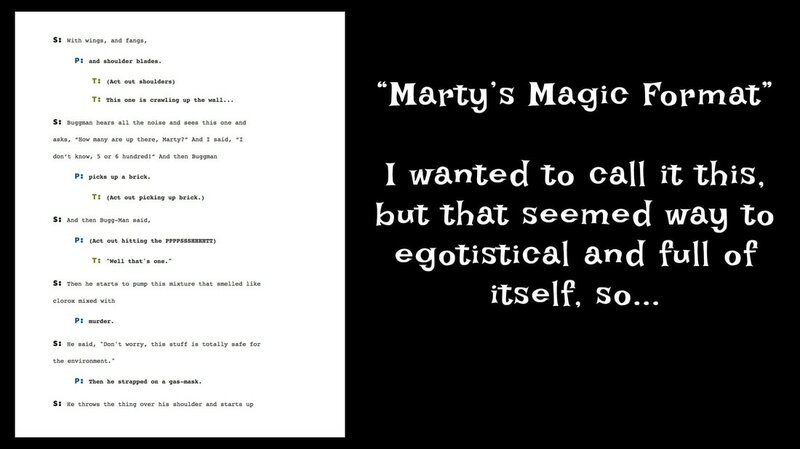 On the right you will see a clip from Bugg-man from Marty's DVD. 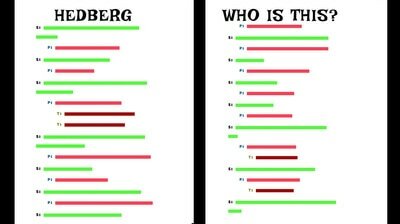 As you can see, visually, from a "number of punch lines and tag lines" it hangs very closely with Hedberg's. ​ For some reason during the session some of the people in the crowd thought what I was saying was I was therefore funnier than Hedberg and they thought that was a conceited egotistical thing to say. Actually what I did say was I had to rig this to make it look even close enough to show so I carefully chose a section of Hedberg's set and of Bugg-man that would play in my favor so I could make this illustration. Anyone who thought I was saying I thought I was funnier than Hedberg either was texting their friends during the session, not paying attention, or just missed the point all together for some other reason. The point was -- as a story teller, in our structured written format, we should be striving to mimic that of the funniest setup-punch comics out there, and this is a clear example of that being the case. 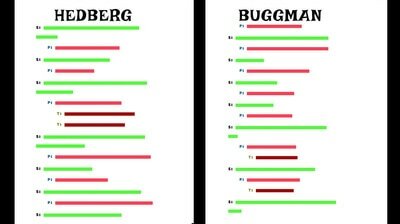 Therefore, it is easy to anticipate the Bugg-man story not seeming too wordy and also seeming enjoyable from a laughs per minute and rhythm stand point. At least on the page shown in this graphic. I was pretending to make it seem like it was as funny as Hedberg as a way to over exaggerate how confident I am in the system. If you believed me when I said it, maybe I framed the jokes about it poorly. I apologize. Most likely though, I had already bored you with an overload of analytical approach and you perked up when I said the person on the right has got more punchlines than Hedberg... or something like that. Who knows, but either way, you missed the point if you thought I was saying I was funnier than Mitch Hedberg, the greatest comic mind of our generation. The key take away from this section is to realize that joke-writers and story-tellers are no different from a laughs-per-minute calculation. And the only way to realize whether or not your stories are standing up against that comparison is put them in the same format as a setup-punch comic and compare them. 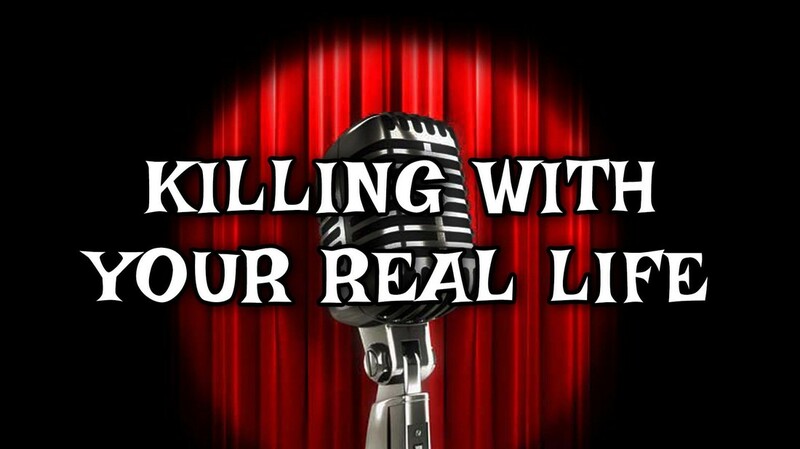 Steve Roye outlined for us that it doesn't matter if we believe it or not, or if we do it on purpose or not, but that stand-ups who are "Killing" are getting a constant 4-7 laughs per minute (or more) and fill 35-40 percent of their stage time with laughter pauses. It's easy to do a simple math run on your set with a stop watch. Listen to your set and click the stop watch and let it run while the audience is laughing, and then click stop when they stop. 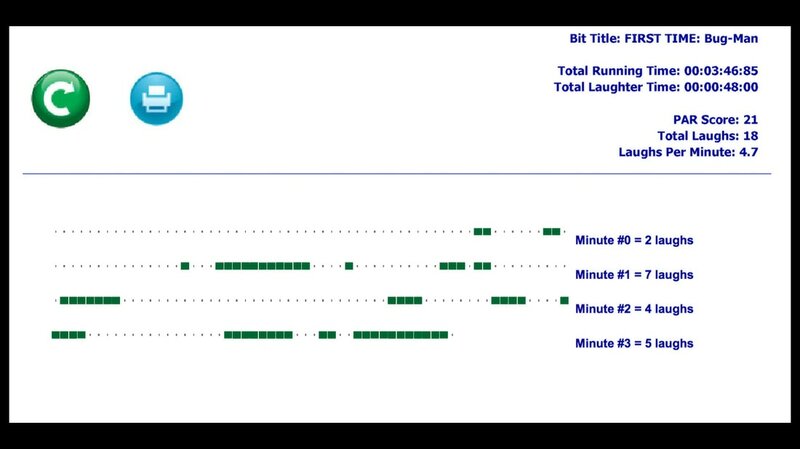 For a five minute set you want 2 minutes of that time to be laughter pauses at least. Other wise you have too many words in your setup lines. Using the formatter on the website www.StayInTheTube.com will create a perfectly formatted graphical representations of your material. Will it make it funny? NO! It will show you quickly and efficiently where it's NOT funny! Here are the key elements to the magic format. Setup lines longer than 3 lines long are where problems exist. Punches and Tags are where the TUBE is! 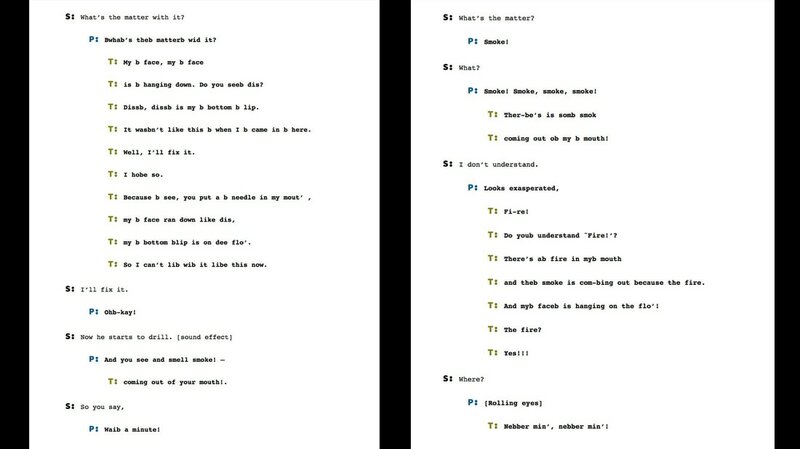 Can you format your material similar to this using Word or other text editors? OF COURSE! Use 1.5 inch margins and size 18 font and double space the lines and it will be in the ball-park. Not perfect, but close. 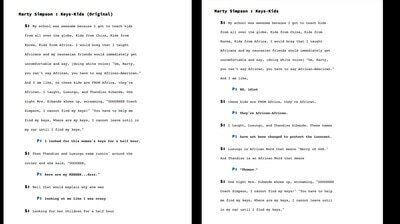 I took the time to code the site to use monolithic spaced fonts so I could predict exactly what character count of letters would wrap to line two of a setup line and so forth, as well as taking the time to properly format the line height so one page of material will equal approximately one minute of material. You may be reading all this and thinking, "How does this help me tell stories from my real life and have them kill?" Well the truth is, it sort of doesn't, but it 100-percent absolutely DOES at the same time! All writing courses for stand-up teach some form of joke-structure. That is very important and you will definitely need to understand those things in order to punch up your stories. But how do you know where and why to punch up your stories? BECAUSE OF THE MAGIC FORMAT!!! Go to open mic and tell your story. Stick to the facts as you remember them and don't concern yourself with making it funny yet. Just tell it. The natural funny parts will jump out at you after you do all the steps. (Remember, open mics are not there to test if people laugh, because often the people in an open mic audience are not your demographic anyway, so it's not relevant. The purpose of the open mic is to SAY THE WORDS INTO A MICROPHONE with nervousness created. Nervousness helps your brain "fight or flight" into funnier descriptions and more elequent language. Read the formatter page on how to best paste the text into it and paste the text into the formatter. Run the analysis on the formatter page on www.StayInTheTube.com. Then click the "Detect Issues" button so the problem areas will be highlighted. Now save it to the database so you can come back to it using your hashtag as described at the site. 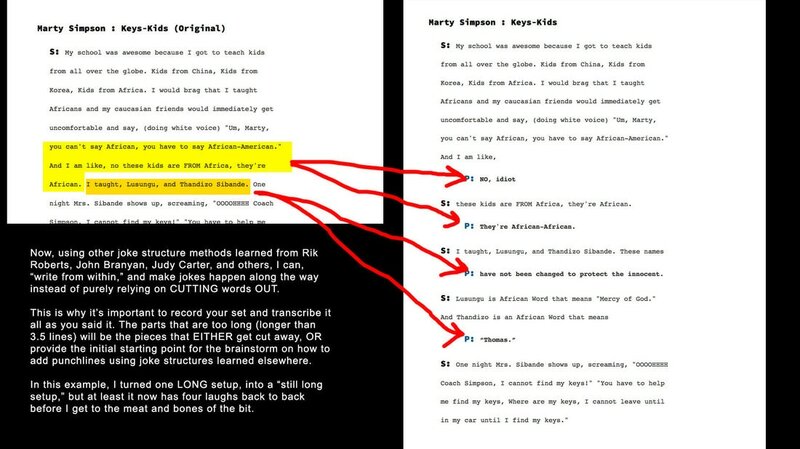 Now look at the highlighted areas. 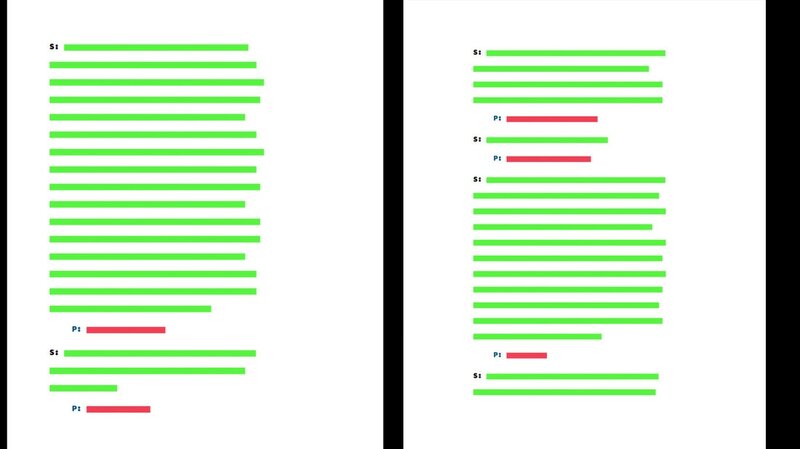 There should be longer setup paragraphs that will now serve as the jumping off point for a writing session in your head. Get to work on either A. Cutting those long setup lines down. or B. Writing from Within and punching up those long setups! You know how when you took John Branyan's writing course or anyone's wrting course, actually coming up with a SUBJECT to write some jokes about was really the hardest part. We arbitrarily in classes choose things like hairspray, or computers, or airports, or something similar. NOW, the TOPICS for the structured jokes will be provided by your setup lines that are too long. Go back and read the African-African setup paragraph that is way too long. 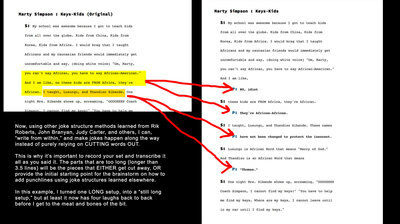 Then look and see what ideas cropped up after the first few times Marty ran this bit and worked on it. I turned a half page setup line with zero laughs into a third page (still too long! :( ) setup line with FOUR punches that hit hard. I made this bit thirty seconds longer and added four laughs! That's pretty good if you think about it. The actual hardest part of this process will be determining which HORRIBLE stories are worth pursuing for years and years that it takes to make them great. 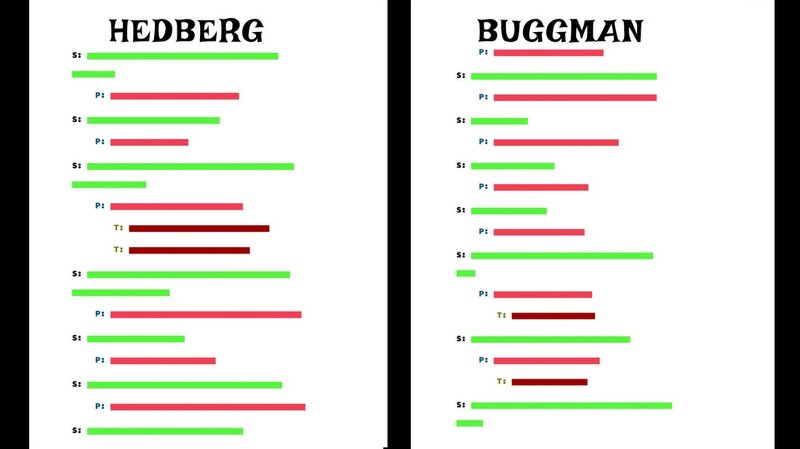 I worked on and am still working on Bugg-man for 9 years! I have the first time I told it on video and it's painful. Below is a graphical representation of the first two minutes. I hope you can recognize the initial long setup paragraph on the first page on the left? Please tell me you can. The key to story-telling comedy is know when you have something special. I sensed the first time I told this that the bats going to the neighbor's house would be special. It took me YEARS to develop the pieces of the puzzle to make it all work so it comes back around. It's painful to watch this first time telling for me now, but I leave it here so you can be encouraged that your first time stories may have potential to become center pieces of your act like Bugg-man has been for mine for a long time now! Click the button that says PDF to see the current version I am telling on stage. It looks a tiny bit better. Hahaha. And typically averages around 46-48 PAR score. Without this analytical, graphical, break-down method of story-telling, I never would have developed the longer form comedy at the pace I did. It took Ron White 20 years to develop "Tater Salad." I am not saying my stuff is as funny as "Tater Salad," but I am saying I developed four long form bits, each over five minutes long, and filmed them all and ended up with the three of them on my first comedy special, "Clean if it Kills Me" in the first six years of doing comedy. Are they as good as they could be? NO!! Are they even finished?? NOPE! I have tagged Bugg-man many times over since recording it on the first DVD. But that doesn't mean it wasn't great the first time through, it's just constantly getting better. You cannot be a story-teller and be a slave to creating FINISHED word-perfect bits every time! It's not going to happen. I rarely tell more than 2 of these in any 45 minute set, but here are a few more if you'd like to see the finished products of the format's magic! 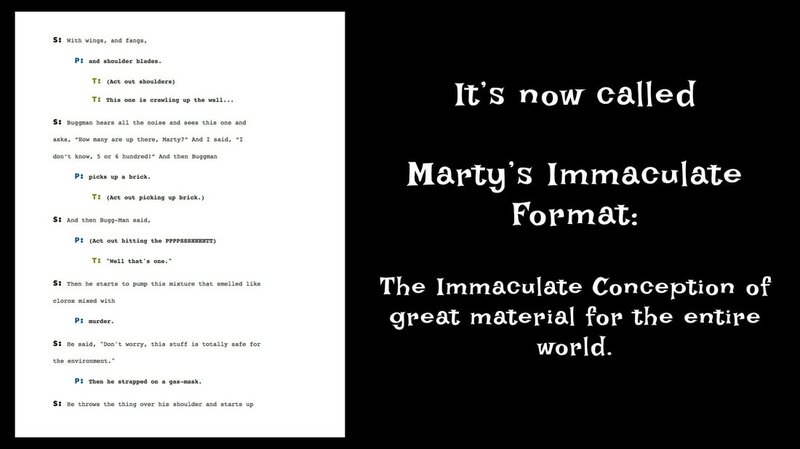 Marty's Exclusive Content: The Egging from Marty Simpson on Vimeo. I've included these Rhonda Corey bits here because many folks seemed interested in this aspect of what I talked about. It's not 100-percent related to the formatting and the story-telling, but it is useful information for the female comics who tell bits like this. 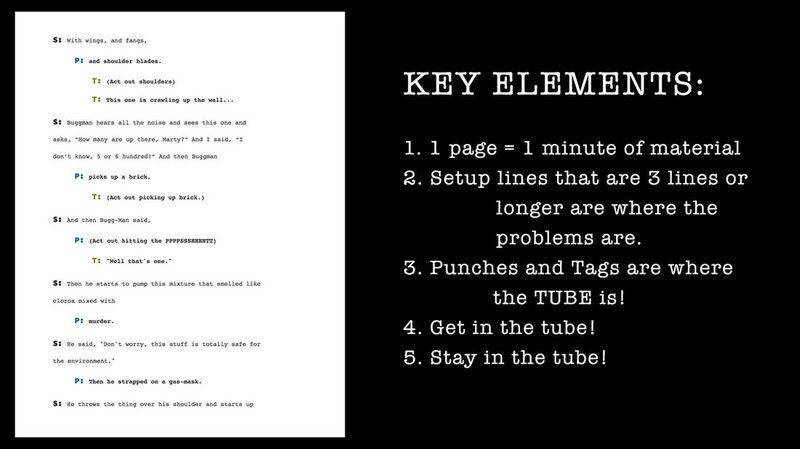 All of the tools to make the magic happen are the website www.StayInTheTube.com. Enjoy!